Perhaps the last TYCO-created railroad was The USA Express. 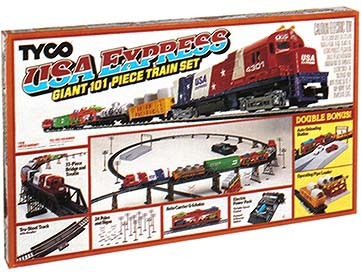 This set with a red-white-and-blue Alco 430 lettered for USA Express came along late in the history of TYCO trains. Some many confuse it with the older Spirit of '76 offerings, however TYCO's USA Express is not seen until nearly 1990 a good time after the 1976 U.S. Bicentennial.